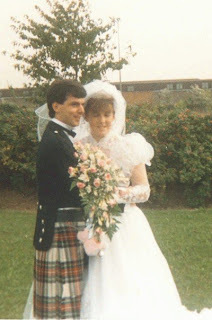 Nicola and I celebrated our 20th wedding anniversary on Wednesday. We had a quiet day off together. After a visit to the shops and lunch in our favourite restaurant - Robinsons we dug out some old pictures and watched a very grainy VHS video of our wedding. I am positive that we really didn't know back then what we were getting into and many other people thought Nicola was making a big mistake. (Even the Rev Ridley suggested that she think again - thanks George!) Well 20 years later I am glad she made the mistake and opened my eyes to something great. Its much better to share life with someone else than to do it alone. Doing life together is not always easy but the rewards are incredible.